In the imagined world of High Flying Bird, the most dangerous man in basketball isn’t LeBron James or Steph Curry. It’s an agent named Ray Burke. Burke represents the No. 1 NBA draft pick in this new tale from Moonlight scribe Tarell Alvin McCraney and director Steven Soderbergh, which is available on Netflix on Friday. Portrayed with wit and warmth by André Holland, Burke is a man who plays chess while everyone else is waiting their turn at Monopoly. Burke’s client, Erick Scott, is played by Melvin Gregg, who bears a small resemblance to Lonzo Ball. Scott and the rest of the freshman NBA class have been twiddling their thumbs through a 25-week stalemate between team owners and players seeking a bigger cut of league revenue. The inaction doesn’t bode well for anyone, but especially not Scott, a newly crowned prince of New York who took out a short-term loan with bad terms to float him through the lockout. Annoyed and inspired, Burke puts a plot in motion akin to Billy Crystal’s machinations in America’s Sweethearts. The difference is that Burke is far, far more cunning. He knows a lockout can’t last forever. “In order to move merch and inspire rap lyrics, they need your services,” Burke tells Scott. 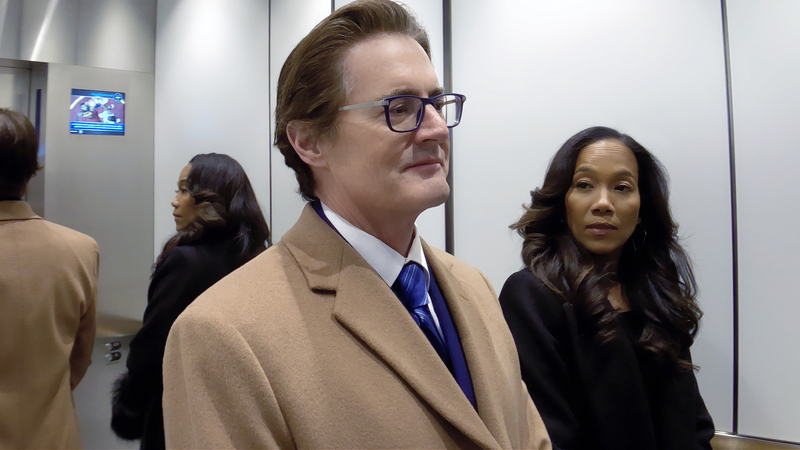 Kyle MacLachlan as team owner David Seton and Sonja Sohn as Myra in High Flying Bird. Spurred by an unshakable love of both basketball and black people, and a moral center instilled by his childhood basketball coach Spence (Bill Duke), Burke gets his clients what they need. In doing so, he also takes power from the gentry class of owners and gives it to the proletariat players. Burke decides to tap into his inner Shirley Chisholm: “I’m ’bout to pull up a chair,” he says. He does so by leveraging a Twitter beef between two rookies into a situation that leaves even the Voldemort of team owners, David Seton (played by Kyle MacLachlan), in a panic. To avoid spoilers, I’ll hold my tongue on the rest of High Flying Bird’s deliciously crafty plot. 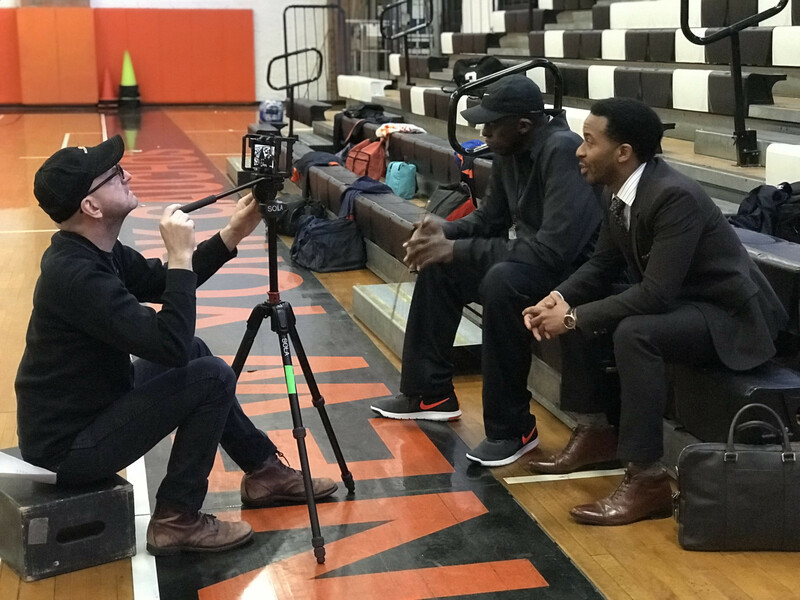 High Flying Bird director Steven Soderbergh shoots footage on an iPhone with actors Bill Duke and André Holland (right). Soderbergh drops his audience into the business of pro basketball, one that is characterized almost entirely by meetings on the tippy-top floors of New York skyscrapers, where the lords of marketing, capitalism and law dwell among the clouds. Adopting the same wide-angle glances and fish-eye perspectives that he used in his last film, Unsane, Soderbergh melds narrative feature with cinéma vérité. Like Unsane, High Flying Bird was shot on iPhones. Documentary-style interviews with real-life NBA players Reggie Jackson, Karl-Anthony Towns and Donovan Mitchell, shot in black-and-white, punctuate the fictional story of Burke and Scott while adding a subtle callback to Spike Lee’s He Got Game. The film takes its name from the 1963 folk song “High Flying Bird,” sung by Richie Havens, with plot twists that recall the clever satisfactions of Ocean’s 11. Soderbergh and McCraney give their audience just enough to piece together what’s happening and no more, trusting that they’ll have fun puzzling together Burke’s moves on their own. Still, by its end, watchers of High Flying Bird will be left wondering: Does Burke know, as poet Audre Lorde once said, that “the master’s tools will never dismantle the master’s house”? Or is he really a true believer? As Spence intones, “You either care all the way or you don’t care at all.” A third-act cameo by the author of a book Burke refers to simply as “a bible” offers an answer to just how dangerous Ray Burke really is.